These are my most favouritest cinnamon buns ever! My sister-in-law had the idea to use this buttermilk biscuit recipe as the base for these rolls. Pure genius. Combine flour, baking powder, salt, baking soda and sugar in a mixing bowl. Using two knives, a pastry blender or your fingers, cut in butter until mixture resembles coarse crumbs. Add buttermilk all at once to dry ingredients and stir with a fork until a soft dough forms. Turn dough out onto a lightly floured surface and knead gently eight to 10 times. On a lightly floured surface, roll dough into a 10 x 12 inch rectangle, about a 1/3 inch thick. In a separate bowl combine brown sugar, softened butter and cinnamon until a paste-like, spreadable consistency is achieved. Spread onto rolled dough. Roll up like a jelly roll. Cut into 1-inch to 1 ½ inch pieces. Lightly grease a pie plate and place cinnamon rolls cut side down into the pan. Bake for about 15 – 20 minutes or until tops are lightly browned. GLAZE: Using approximately ½ cup icing sugar, add enough milk (small amount, it goes far) to make a thin glaze. 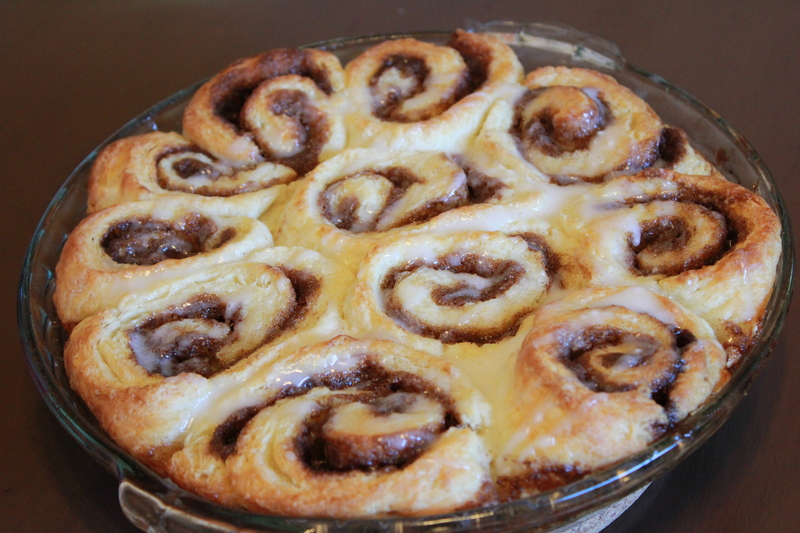 Drizzle over cinnamon buns when they have cooled a slight bit. Just a slight.